Fiat Crushed in Vehicle Dependability Survey - 24/7 Wall St.
J.D. Power uses a measure of problems per hundred vehicles. Data in the survey are for 2016 model vehicles that original buyers have owned for three years. A total of 32,952 people were questioned for the study over the period of October to December 2018. The industry average for the results was 136. Fiat scored 249, by far the worst score. The top brand, Lexus, had a score of 106. Fiat posted poor sales for the full year 2018, down 41% to 15,521. This means Fiat dealers sold an average of only 43 cars per day nationwide. Fiat has done poorly in several surveys recently, including others from J.D. Power and Consumer Reports. As Ford and GM exit the small car segment of the U.S. market, it is a mystery why Fiat Chrysler has not done the same. 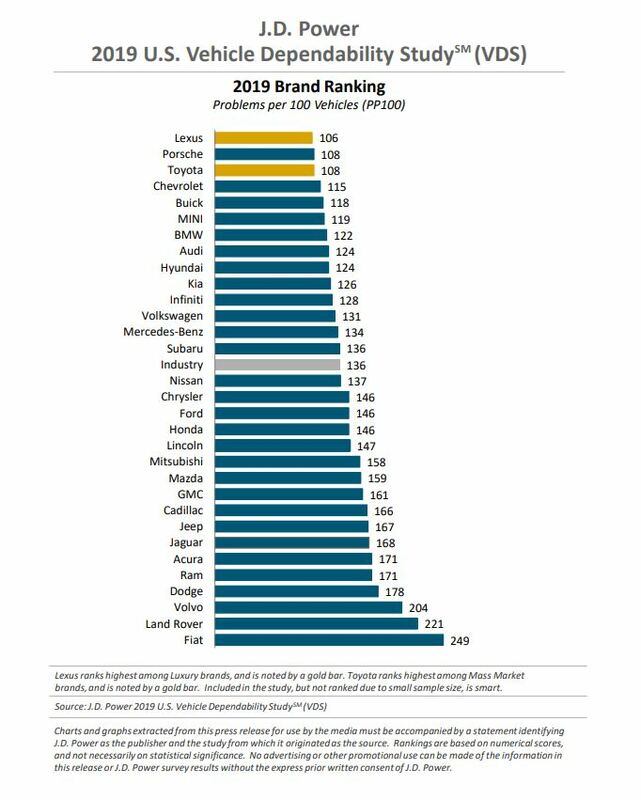 Other Fiat Chrysler brands did poorly in the survey. Dodge ranked fourth from the bottom with a score of 178. Ram, Fiat Chrysler’s truck division, ranked fifth from the bottom with a score of 171. Jeep ranked eighth from the bottom with a score of 167. Fiat Chrysler had a good year in terms of total vehicle sales in 2018, up 9% from 2017 to 2,235,204. The increase was well above the industry reading, which was up 0.3% to 17.27 million.